A regular breeding resident and migrant; the Loggerhead Shrike was a rare species during the Minnesota Breeding Bird Atlas (MNBBA). Distributed across the southern half of the United States, the Loggerhead Shrike extends its range northward throughout the Great Plains to western Montana and east through the grasslands of the Upper Midwest. It also is found in the southern Prairie Provinces and in central Washington and central Oregon. It is absent from the mountains of western Montana, Idaho, eastern Washington, and eastern Oregon. To the south, it is found throughout central and western Mexico. Sparsely distributed throughout their range, Loggerhead Shrikes are most abundant along the Gulf coast of eastern Texas and Louisiana (Figure 1). Assigned a Continental Concern Score of 12/20 and identified as a Common Bird in Steep Decline by Partners in Flight; officially listed as an Endangered Species in Minnesota and designated a Species in Greatest Conservation Need by the Minnesota Department of Natural Resources. In the northern portion of its range, including Minnesota, the species is a short-distance migrant that winters in the southern United States and Mexico. Farther south, breeding populations are year-round residents. Primarily large insects, such as grasshoppers and crickets, as well as some small birds, reptiles, mammals, and carrion. Well-known for attacking larger prey behind the head and paralyzing them following pursuit; large invertebrates and vertebrates are also impaled on a thorny bush or barbed wire fence before consuming. Open-cup nest placed in a dense and often thorny shrub or small tree. Breeding distribution and relative abundance of the Loggerhead Shrike in North America based on the federal Breeding Bird Survey, 2011-2015 (Sauer et al. 2017). Roberts (1932) described the Loggerhead Shrike as an “abundant” summer resident throughout southern Minnesota, becoming “increasingly less common northward through the Red River Valley”. The shrike was frequently seen perched on telephone wires in the early 1900s, and Roberts provided a metric of the shrike’s former abundance that present-day birders can easily relate to. During a 12-day automobile trip through southwestern Minnesota in June 1926, he counted 89 Loggerhead Shrikes as he traveled along nearly 500 miles of roadways. A similar trip two years later, which originated in Douglas County in west-central Minnesota and ended in Kittson County on the Canadian border, resulted in a count of 41 shrikes. Today, birding enthusiasts would be delighted if, upon taking similar road trips, they sighted just a couple of shrikes! At the time, Roberts had compiled confirmed nesting records (nests with eggs) from 9 counties (Rock, Pipestone, Martin, Mower, Fillmore, McLeod, Hennepin, Traverse, and Polk) and inferred nesting records (e.g. adults with juveniles) from 3 counties (Marshall, Sherburne, and Stearns). When Green and Janssen provided an updated account of the species in 1975, there was little in their description that suggested the species had experienced any change in its status. Although they noted it was very scare in the northeastern region and in adjacent counties in north-central Minnesota, they still described the Loggerhead Shrike as a statewide resident, with nesting records as far north as the town of Chisholm in St. Louis County. But change was well under way by the early 1970s. The shrike was added to the National Audubon Society’s Blue List in 1972, an early-warning system designed to bring attention to declining species. And when the federal Breeding Bird Survey (BBS) was begun in the mid-1960s, the Loggerhead Shrike demonstrated a 50% population decline in the first 15 years of the survey (Coffin and Pfannmuller 1988). Indeed, these changes led to the official classification of the species as state Threatened in 1984. Only 12 years after Green and Janssen provided their updated account in 1975, Janssen’s 1987 update described the shrike as “a rare and very local resident in the state.” Its distribution was narrowly restricted to western Minnesota, from Clay County south to the Iowa border, to the Minnesota River valley, and to eastern Minnesota, from Morrison County south. Breeding had been confirmed in 18 counties since 1970. Hertzel and Janssen (1998) later added 5 more counties to the list. Classification as a state Threatened Species spurred an increased emphasis on survey work and field investigations. Most significant was the initiation of a two-year assessment of the shrike’s statewide distribution, population dynamics, and habitat selection from 1986 to 1988 (Brooks 1988). The statewide survey, conducted during the study’s 1986 field season, identified 32 nesting pairs in 12 counties that ranged from Clay County in the northwest to Fillmore County in the southeast. Fifty-six percent of the pairs, however, were located in just 3 widely dispersed counties: Sherburne (8 pairs), Clay (6 pairs), and Goodhue (4 pairs). When Brooks compared her results with Loggerhead Shrike reports compiled from seasonal reports published by the Minnesota Ornithologists’ Union, it appeared that little had changed in the past 10 years (Brooks and Temple 1986). In 1989, the Minnesota Department of Natural Resources (DNR) launched a Loggerhead Shrike monitoring program built on the outcomes of Brooks’s field studies. Eight road transects were established in areas with the highest nesting concentrations. Conducted annually from 1989 through 1994, the monitoring indicated further declines in the species’ abundance. Concern regarding the effectiveness of the survey, however, prompted the department to launch a new study in 1995 and 1996 designed to assess the most effective and efficient method for monitoring population trends (Eliason 1996). During the 1995 field season, 24 nesting attempts were observed in 13 counties; during the 1996 field season, only 13 nesting attempts were observed in 8 counties (Eliason 1996). Additional studies confirmed that the road transects surveyed from 1989 through 1994 did not provide as accurate an assessment of the population as a more in-depth survey of known territories. Unfortunately, the amount of personnel time required to implement the latter approach was not considered cost-effective. In subsequent years, targeted survey work was limited. Field work conducted by the Minnesota Biological Survey identified 33 breeding season locations for the Loggerhead Shrike, all within the primary breeding range described by Janssen (1987). Nearly one-third of the records, however, were restricted to Clay and Dakota Counties. Then, in 2008, DNR staff conducted a survey in Dakota, Goodhue, and Rice Counties and in several counties in the Anoka Sandplain that had previously supported nesting pairs. Loggerhead Shrikes were observed at only 7 locations (Minnesota Department of Natural Resources 2012). The continued decrease in the number of reports led to the reclassification of the shrike as a state Endangered Species in 2013 (Minnesota Department of Natural Resources 2013). During the MNBBA, observers reported 50 Loggerhead Shrike records in 0.7% (33/4,737) of the surveyed atlas blocks and in 0.6% (13/2,337) of the priority blocks. Breeding evidence was confirmed in 14 blocks (Figures 2 and 3; Table 1). The birds were observed in 18 of Minnesota’s 87 counties and were confirmed breeding in 7 counties: Anoka, Clay, Dakota, Goodhue, Olmsted, Yellow Medicine, and Wilkin. Wilkin and Yellow Medicine Counties were new additions to a list of counties with confirmed nesting published by Hertzel and Janssen in 1998. Breeding was reported as possible in Polk County, where a family of birds was observed perched on a telephone wire. The young, however, were fully capable of flight, so the exact block where nesting occurred could not be determined. In addition to the records compiled by the atlas, 1 nesting record was reported to the Minnesota Ornithologists’ Union during the atlas period in Otter Tail County on August 7, 2011; unfortunately details were insufficient to assign it to an atlas block (Minnesota Ornithologists’ Union 2016). An atlas observation from southern St. Louis County was particularly interesting, although this was not the first time shrikes had been reported in the vicinity; summer reports from the county date back to at least 1966 (Minnesota Ornithologists’ Union 2016). Although Loggerhead Shrikes continue to be reported from widely scattered sites throughout the state each year, the majority of confirmed nesting reports remain restricted to Dakota County. This is a notable shift from the mid-1980s, when Brooks and Temple (1986) documented 12 of 32 nests from the central Minnesota counties of Benton, Morrison, and Sherburne. That same year, 1986, only 2 nests were reported in Dakota County. By 1995, the 3 central counties supported only 1 nest, while there were 9 nest attempts in Dakota County (Eliason 1996). The Loggerhead Shrike clearly has become a very rare and vulnerable species in Minnesota. Despite its rarity, an analysis of suitable habitat by the MNBBA illustrates that a large portion of western and southern Minnesota still provides habitat potentially conducive to supporting breeding Loggerhead Shrikes (Figure 4). The reasons for their absence over much of the suitable landscapes are not well understood (Yosef 1996). Elsewhere in its breeding range, the species has experienced declines similar to those documented in Minnesota. As eastern forests were cleared, small farm fields bordered by woody plantings provided ideal habitat for the shrike in the late 1800s and early 1900s. Similar range expansions occurred in the northern Great Plains and north into southern Canada as farm shelterbelts provided new nesting habitat (Cade and Woods 1997). As agricultural practices intensified, the large, unbroken fields of wheat and corn became less suitable habitat for the shrike. Declines were noted in many regions as early as the 1930s, 1940s, and 1950s (e.g., Cade and Woods 1997; Rodewald et al. 2016; Chartier et al. 2013). Not only did the species’ abundance decline dramatically, the overall extent of its breeding range receded “well south of its maximum known breeding distribution” earlier in the 20th century (Cade and Woods 1997). Breeding distribution of the Loggerhead Shrike in Minnesota based on the Breeding Bird Atlas (2009 – 2013). Summary statistics of observations by breeding status category for the Loggerhead Shrike in Minnesota based on all blocks (each 5 km x 5 km) surveyed during the Breeding Bird Atlas (2009-2013). Summary statistics for the Loggerhead Shrike observations by breeding status category for all blocks and priority blocks (each 5 km x 5 km) surveyed during the Minnesota Breeding Bird Atlas (2009-2013). Landcover suitability of the Loggerhead Shrike in Minnesota based on habitat, landscape context, and climate data gathered during the Minnesota Breeding Bird Atlas (2009-2013) using the MaxEnt modeling approach. An inhabitant of open country interspersed with shrubs and small trees, the Loggerhead Shrike can be found in a diversity of habitats, ranging from upland native prairie, oak savannas, and riparian areas to pastures, old orchards, golf courses, and cemeteries (Kaufman 1996; Yosef 1996). Across the Upper Midwest, the shrike’s habitat has been broadly characterized as open, agricultural sites interspersed with grasslands (Brooks and Temple 1990a). Studies in the eastern United States have shown a correlation with pasture lands, water sources, and landscapes that provide fences, overhead utility lines, and rights-of-way. Active pasture lands are more likely to be reoccupied than idle grasslands where the vegetation grows in height during the course of the breeding season (Luukkonen 1987; Novak 1989). The significance of a nearby water source is not clear. In Minnesota, the species is frequently found in upland prairies, grasslands, and agricultural fields where suitable perches are available to search for prey and scattered trees and shrubs are available for nesting. Small farmsteads that still include hedgerows and fence lines are especially suitable, as are planted shelterbelts (Coffin and Pfannmuller 1988). One of the most reliable sites for finding Loggerhead Shrikes in the state is a stretch of unpaved roads in central Dakota County. The roads border agricultural fields interrupted by scattered homes that are landscaped with small trees and shrubs (Figure 5). Red cedar has been reported as the most frequently used nest tree (44%) in Minnesota. A variety of other species that have a very shrubby or bushy growth with thorns or spines are also used, including American plum, hawthorns, and Russian olive. Nests are usually placed in isolated trees or within narrow hedgerows or windbreaks that are located adjacent to agricultural fields or within grassland habitats or pastures (Brooks and Temple 1990a). Typical breeding habitat of the Loggerhead Shrike in Minnesota (© Gary T. Seim). Data gathered by the federal Breeding Bird Survey have been used to generate a population estimate of 4.2 million birds in 2016 (Rosenberg et al. 2016); just a few years earlier the estimate was 4.8 million birds, at which time the statewide estimate for Minnesota was 1,000 birds (Partners in Flight Science Committee 2013). The statewide estimate seems particularly high given the rarity of recent observations. The Loggerhead Shrike is sparsely distributed throughout its breeding range; breeding densities are especially low in Minnesota (Figure 1). Rarely observed along BBS routes in the state, across the entire BBS survey area in North America, an average of just 2 birds are observed per BBS route each year (2,036 total routes). The Gulf Coastal Prairie Region, a narrow strip of coastal habitat in southern Louisiana and Texas, supports the highest breeding density of shrikes in North America (Figure 1). Here the average number of birds along 42 BBS routes in the region is 13 (Sauer et al. 2017). BBS data clearly document the species’ significant and steady population decline. Since 1966, the continental population has declined an average of 2.78% per year (Figure 6), resulting in a cumulative decline of 74% from 1970 to 2014 (Rosenberg et al. 2016). The rate of decline shows some hint of abating in recent years. Numbers are too low in Minnesota to generate a statistically reliable population trend, but available data certainly suggest a precipitous decline (Sauer et al. 2017). Nationwide there are only a few locations, primarily in the western United States, where populations are increasing (Figure 7). Given the shrike’s significant decline, biologists estimate that the amount of time before an additional 50% of the population is lost could be as little as 24 years (Rosenberg et al. 2016). As noted earlier, in addition to a decline in numbers, the species’ range has also contracted. Cade and Woods (1997) suggest that its distribution is retreating to what they speculate it may have been prior to European settlement. Numerous hypotheses have been suggested to explain the shrikes’ steady population decline, including habitat loss, low reproductive success, pesticide contamination, interspecific competition, and vehicle collisions (Yosef 1996; Pruitt 2000). A grassland dependent species, the impact of pesticide use may be particularly significant. Studies on organochlorine pesticides, however, concluded that although former pesticide use had a small impact on eggshell thickness of Loggerhead Shrikes, it did not decrease overall reproduction. Since then, many of the organocholine pesticides in use during the 1970s and 1980s are either banned or their use significantly restricted. Nevertheless, new classes of pesticides are always being introduced and can potentially impact grassland species in many other ways including direct mortality on adults and negative impacts to food supplies. While the contribution of agricultural chemicals to the shrike’s decline is not well understood, biologists do consider habitat loss to be a major contributor. More intensive agricultural practices in the Great Plains and Upper Midwest and reforestation of areas in the Northeast are thought to be responsible for much of the decline, but further study is clearly warranted (Cade and Woods 1997; Pruitt 2000). In Minnesota, changes in agricultural practices have certainly had a noticeable impact on habitat suitability. Conversion of pastures to row crops, the loss of hedgerows and windbreaks that provided nesting cover, and the absence of hunting perches or nesting trees in grassland habitats have all had local impacts on nesting shrikes (Eliason 1996). Many biologists have noted, however, that habitat that appears “visually suitable” still remains unoccupied (Eliason 1996; Brooks and Temple 1990b; Pruitt 2000). Overwinter survival may be another key factor negatively influencing northern populations. Not only do the northern migrants need to contend with habitat loss in southern states where they winter, they must compete for resources with those shrikes that remain in the region as year-round residents (Brooks and Temple 1990b). 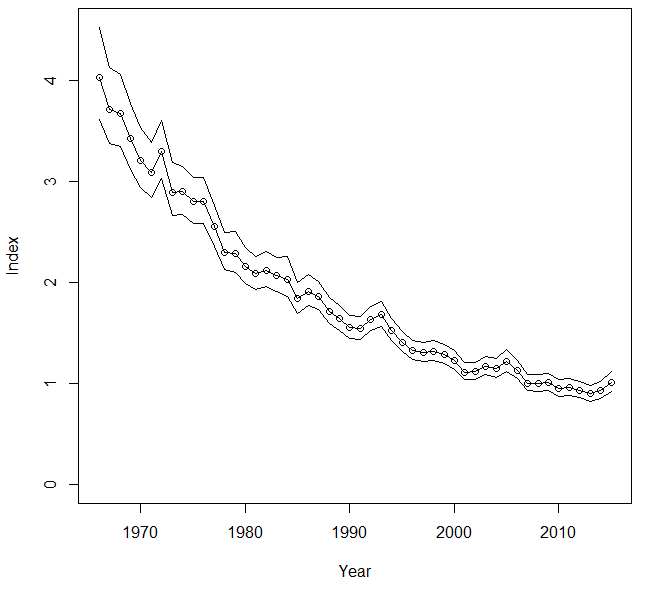 Breeding population trend for the Loggerhead Shrike in North America from 1966-2015 based on the federal Breeding Bird Survey (Sauer et al. 2017). Population trend map for the Loggerhead Shrike in North America from 1966-2015 based on the federal Breeding Bird Survey (Sauer et al. 2017). In light of its steady population decline and northern range contraction, the Loggerhead Shrike has been assigned a Continental Concern Score of 12/20 and has been designated a Common Bird in Steep Decline by the 2016 Partners in Flight Landbird Conservation Plan (Rosenberg et al. 2016). In Minnesota, the shrike was officially listed as a Threatened Species in 1984 and upgraded to Endangered in 2013 (Coffin and Pfannmuller 1988; Minnesota Department of Natural Resources 2013). It also has been designated a Species in Greatest Conservation Need (Minnesota Department of Natural Resource 2015). Specific conservation plans and management recommendations are limited and challenging to carry out in part because much of the currently occupied and suitable habitat occurs on private lands. Suggestions include leaving fence lines for shrikes to use for perching and impaling their food, maintaining brush along fence lines, and leaving scattered trees in pastures and fields. Programs that provide financial incentives for farmers to retire highly erodible croplands and maintain them as permanent grass cover also are beneficial. These guidelines are included in a brief landowner’s guide for maintaining and encouraging Loggerhead Shrikes prepared by the Minnesota Department of Natural Resources (1996). Although the species’ response to warming temperatures has not been intensively investigated, a preliminary assessment has ranked its vulnerability as low (North American Bird Conservation Initiative 2010). Perched on the northern periphery of its North American range, the Loggerhead Shrike in Minnesota has a precarious future. Interagency landscape initiatives, such as the Minnesota Prairie Conservation Plan (Minnesota Prairie Plan Working Group 2011), designed to maintain a matrix of diverse agricultural lands interspersed with protected grassland habitats, are encouraging. However, the species’ future is clearly dependent on the cooperation and support of private landowners in conservation efforts. Brooks, Bonnie L. 1988. “The Breeding Distribution, Population Dynamics, and Habitat Availability and Suitability of an Upper Midwest Loggerhead Shrike Population.” MS thesis, University of Wisconsin-Madison. Brooks, Bonnie L., and Stanley A. Temple. 1986. “The Breeding Distribution of the Loggerhead Shrike in Minnesota: A Preliminary Report.” Loon 58: 151–154. Brooks, Bonnie L., and Stanley A. Temple. 1990a. “Habitat Availability and Suitability for Loggerhead Shrikes in the Upper Midwest.” American Midland Naturalist 123: 75–83. Brooks, Bonnie L., and Stanley A. Temple. 1990b. “Dynamics of a Loggerhead Shrike Population in Minnesota.” Wilson Bulletin 102: 441–450. Cade, Thomas J., and Christopher P. Woods. 1997. “Changes in Distribution and Abundance of the Loggerhead Shrike.” Conservation Biology 11: 21–31. Luukkonen, David R. 1987. “Status and Breeding Ecology of the Loggerhead Shrike in Virginia.” MS thesis, Virginia Polytechnic Institute and State University. Novak, Paul G. 1989. “Breeding Ecology and Status of the Loggerhead Shrike in New York State.” MS thesis, Cornell University.